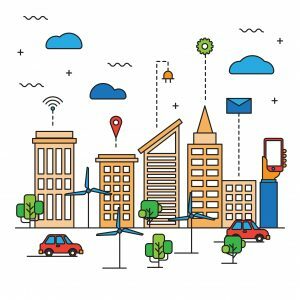 Smart City – Moving Forward ! 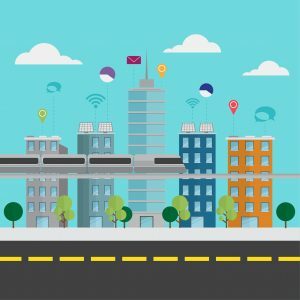 A Smart City is an urban development vision to integrate multiple Information and Communication Technology and Internet of Things solutions in a secure fashion to manage a city’s assets – the city’s assets include, but are not limited to, local departments’ information systems, schools, libraries, transportation systems, hospitals, power plants, water supply networks, waste management, law enforcement, and other community services. The goal of building a smart city is to improve quality of life by using Urban Information and Technology to improve the efficiency of services and meet residents’ needs. 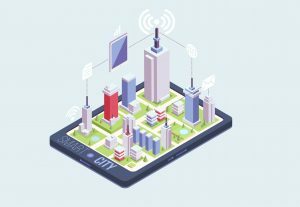 Information and Communication Technology allows city officials to interact directly with the community and the city infrastructure and to monitor what is happening in the city, how the city is evolving, and how to enable a better quality of life. Through the use of sensors integrated with real-time monitoring systems, data are collected from citizens and devices – then processed and analyzed. The World Health Organization states that the world’s urban population is expected to double by 2050. Such an increase in population implies a detailed plan to achieve a better appraisal of resources. Smart City technological initiatives are about working plans to enhance sustainable growth and improve the quality of life of the citizens. Smart Governance: Entails public, private and civil organisations so the city may work at its best as one organism fuelled by Infrastructures, Hardware, Software and Data Mining. Smart Governance is about transparency and open government enabled by apps in terms of citizens’ decision-making and e-public services. Smart Economy: Entails e-business processes and e-commerce to boost sustainable growth and productivity. Smart People: People fed since childhood by e-skills that promote creativity, critical thinking and Independence fostering innovation by all means. Smart Mobility: Smart Mobility means integrated transport and logistics systems supported by Wise Infrastructures, Hardware, Software, Data Mining and Clean Energies. Smart Living: Smart Living means healthy and safe living through smart technologies and apps that enable responsible life styles, behaviour and consumption. Smart Environment: this means renewable and clean energies managed by Information and Communication Technology monitoring. The main objective is a clean environment with pollution and trash disposal under control. Three powerful concepts are strongly connected to Smart cities initiatives: Technology, Institutions (Private/Public) and the complexity of humans. The complexity of humans has been dealt with by disciplines like Philosophy, Psychology, Sociology, Cybernetics, and so on but it seems that their results are not really plausible to offer solutions for the majority of the population, as witnessed by increasing of mental diseases to the date. It is time for all of us to move forward along with the Technology in order to make lives easier for all.